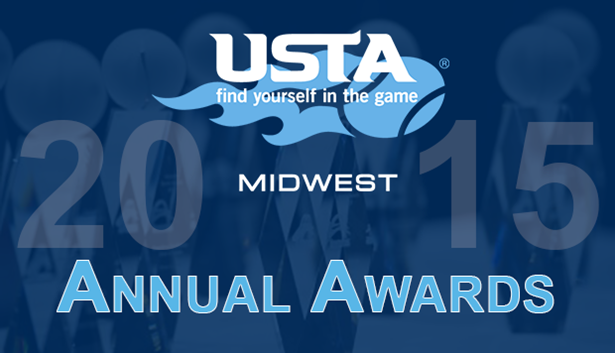 The USTA/Midwest Section is excited to announce its 2015 Midwest Spring Award recipients. The official awards presentations will be made over the next few months at various locations. Cap Leighton Award – Jorge Capestany from Holland, Mich.
Capestany has been instrumental promoting and growing tennis across the District, Section, Nationally and around the world. He is the Head Tennis Director at Hope College and a current tennis teaching professional. Capestany is a Past President of the Western Michigan Tennis Association (WMTA) and continues to give back to the District by currently serving on two committees. He is also a Past President of the USPTA Midwest Division. Capestany's list of honors include: 2015 Tennis Industry Association/Professional Tennis Registry Commitment to Industry Award, induction into USPTA/Midwest Division, two-time USPTA Midwest Professional of the Year, and six-time USPTA Michigan Professional of the Year. Capestany currently serves as a USTA Faculity member conducting workshops for coaches. He is also a member of the Wilson Premiere Speakers Team, and a consultant to many clubs in the tennis industry. Fred Burns Award – Marty Budner from Warren, Mich.
Budner has been the Sports Editor for the Observer & Eccentric Newspapers for 38 years. The newspaper is the largest and most popular suburban Detroit newspaper. Budner remains committed to covering the local story. He has received numerous Michigan Press Association Awards with the most recent including the 2013 Best Sports Section honor. Budner covers USTA tournaments and events, high school tennis matches, and local club tournaments. He provides the highest quality and volume of coverage of sports with detail and energy. Budner's skills and hard work have helped spread the word about tennis throughout the community, and assist supporting the growth of tennis in Southeastern Michigan. Helen Shockley Award – Molly Fletchall from Carmel, Ind. Fletchall is currently ranked No. 2 in Central Indiana and No. 60 in the USTA/Midwest Section. She competes in USTA and USTA/Midwest Section tournaments. Fletchall received a 2013 USTA/Midwest Level II Tournament sportsmanship award, and two USTA Jr. Team Tennis sportsmanship awards. In addition to these awards, she was honored with the 2014 Indianapolis Junior Tennis Development Leadership Award and Central Indiana Tennis Association Barbara Wynne Award. Fletchall played high school varsity tennis all four years, and was the 2014 Indiana High School Athletic Association State (IHSAA) Doubles Champion. Fletchall has competed as part of the Central IndianaTennis Association squad at the prestigious USTA/Midwest Section Marian Wood Baird Cup. Fletchall will play collegiate tennis at Ball State University this fall. Fletchall co-founded the Special Olympics of Hamilton County in 2013. It is the only Special Olympics program in the state of Indiana, and USTA registered Adaptive Tennis program in Indiana. Fletchall is also involved with Champions Together which is a program sponsored by the IHSAA. She is also co-authoring a book called "Champion Citizen: Jean Driscoll". Wallace R. Holzman, Sr. Award – Gianni Ross from LaGrange, Ill.
Ross is currently ranked No. 5 in USTA Boys' 16, No. 1 in USTA/Midwest Section Boys’ 16 and No. 1 in Chicago Boys’ 16. Ross was honored as the 2014 Chicago Tennis Patrons Junior Player of the Year. Ross won the 2014 USTA/Midwest Indoor Closed Championships Boys' 16 singles title. He was a member of the 2014 US Junior Davis Cup team which won the title in Mexico last fall. Ross also won the 2014 USTA Boys' 16 National Championships doubles title which provided an automatic main draw entry into the 2014 US Junior Open last fall. Ross plans to play on his varsity high school tennis team this fall. Member Organization of the Year Award – Milwaukee Recreation in Milwaukee, Wis.
Milwaukee Recreation is enriching the lives of Milwaukee youth, adults and families through many innovative programs. The organization aims to improve academic achievement of all students during non-school hours, strengthen families, reduce crime in neighborhoods, and enhance well-being of all residents. Milwaukee Recreation offers a summer tennis program for youth between ages 4-17. Approximately 200 youth participated in the program last summer at eight locations around the area. Milwaukee Recreation was awarded the 2014 Wisconsin Tennis Association Member Organization of the Year Award. Frank Dowling Award – Charles Strauch from Carmel, Ind. Strauch has been a USTA certified official for more than five years at the Central Indiana Tennis Association (CITA) and USTA/Midwest Section levels. He has devoted many hours towards officiating grassroots tournaments helping players understand the rules. Strauch has officiated USTA/Midwest Section League events, CITA USTA League events, CITA USTA Jr. Team Tennis events, and local tournaments. Strauch mentors new officials and has provided training for new umpires as well as umpires needing annual recertification. Strauch exhibits superior values of professionalism, knowledge of rules, fairness, and integrity as an official. Wheelchair Performance Award – Julie Fritz from Indianapolis, Ind. Fritz is a wheelchair tennis coach at the Rehabilitation Hospital of Indianapolis since 2004. She has conducted and hosted numerous clinics to introduce new players to the sport. Fritz travels with her own players to various tournaments to provide support. She offers disability awareness assemblies at schools where wheelchair tennis is demonstrated to kids in school. Fritz also travels to Northern Indiana and Illinois to coach other wheelchair players. Fritz has been a USTA/Midwest Section volunteer for ten years, and currently serves on the Wheelchair Sub-Committee. She has been a teaching professional for 15 years, coach for a middle school tennis team for 11 years, and organizes a USTA Jr. Team Tennis winter league each year.